Come August the ATAP comes back out refreshed acknowledging the issue raised above. The first question is does it acknowledge the original problem of high population growth? The answer is finally yes – with reluctance. The second question is does the proposed solutions cater for the accelerated growth? No – not entirely. PENLINK (as a two lane toll road) and the Southern Airport Line were examples of catering for accelerated population growth while continued fart arsing with the Northern Airport Line was an example not catering for accelerated growth. Government officials have quietly prepared a plan to fast-track light rail – or a rapid bus service – for Queen Street and Dominion Road to Mt Roskill. Just a few months ago finance minister Steven Joyce dismissed this project as “pork barrel politics”. But it’s stage one of light rail to the airport and it looks like the government will adopt the policy. Last Sunday the government announced $2.6 billion in extra expenditure on Auckland transport over the next 10 years. It also said the 30-year transport plan for Auckland was being revised, and when the new report was ready further announcements would be made. A new rapid transit line up Queen St and out to Mt Roskill is planned for the next 10 years at a cost of $700 million. It will be light rail (trams) or a separated bus route like the Northern Busway, to be decided by business case analysis. Penlink – a highway to provide a new link from the northern motorway to the Whangaparaoa Peninsula – is also planned for the next 10 years at a cost of $240 million. But it won’t be a four- or six-lane road: two lanes are proposed, with the capacity to add more later. And it could be a toll road. The update says: “The project’s business case suggests it is well suited to a toll”. Neither of these projects was mentioned last Sunday, and the report also contains other projects, not mentioned at that time, that are proposed for fast-tracking (see below). With these new projects the funding shortfall for ATAP over the next 10 years will rise from $4 billion to $5.9 billion. This is the net effect of $2.9 billion in extra spending and $1 billion in extra revenue (more passengers using more services). It is becoming very clear that we are being presented with a choice come the election. National's Simon Bridges says rail to Auckland airport isn't needed in the next decade. The above is the demonstration of Government being reactive while the Opposition are being proactive towards transit investment. Why a new plan so soon? It took the government and council two years of hard negotiating to agree on the original ATAP and it was completed only in September last year. That is, a 30-year plan, less than a year old, is already out of date. What happened? The answer they give that Auckland’s population is growing faster than expected. They now expect the city to gain 503,000 more people in the next 10 years, which is up almost 100,000 from the number expected a year ago. That will mean a total population by 1.9 million by 2026. The update expects that 70% will be within the current urban limits and 30% outside it, which remains in line with Unitary Plan forecasts. Two things to note about this. One is that the current rate of growth in Auckland has been consistent since 2014. In other words, when ATAP was negotiated, the government did not accept the city was growing as fast as it is. It’s got the message now. The other is that planning for Auckland needs some better assumptions. The usual approach is to use three levels of prediction: low, middle and high. Funding decisions tend to be made on the low level. You don’t spend more money than you need to, and as a matter of policy the risk of overspending is more important than the risk of not providing enough services. Surely it’s now clear that the risk of not preparing is far worse than the risk of building a railway or a school that might not be filled as quickly as anticipated. In fact, surely it’s now clear that that last statement is oxymoronic: build another railway or school and they will certainly fill up quickly. We need to stop being so risk averse. Running infrastructure ahead of the curve works better than being in catch up mode. 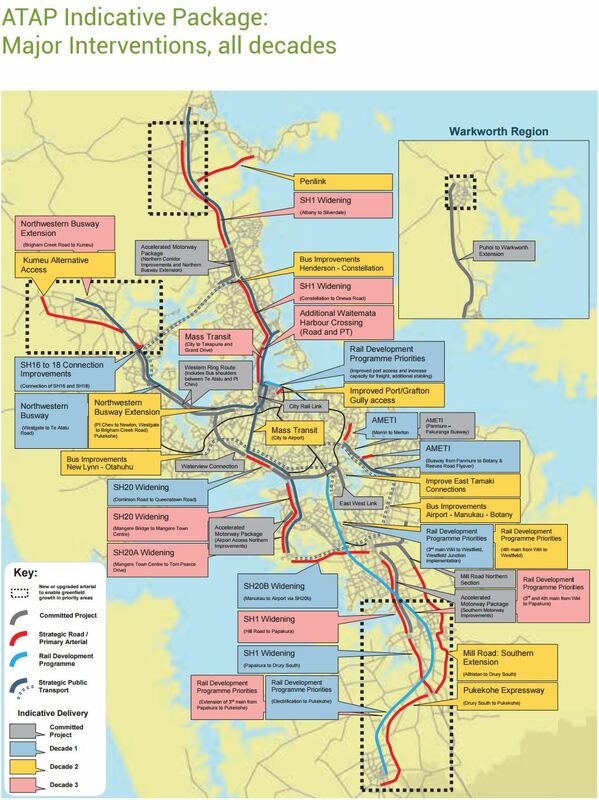 Labour’s promise of multiple PT projects is in the same bucket as Len Brown’s promise of heavy rail under the CBD, to the airport, and to the North Shore. It is political speak for “vote for us, and we’ll do some of this and discard the rest”. The end result is about the same as National’s reactive approach. It’s just one party promising more than can deliver, and another delivering more than they promised, but either way we get the same result. Is this report out of date even before it is released? Certainly the comments on Whenuapai in the Northwest are very much at odds with the recent HIF announcement by the Government. We also understand that a further large housing development in Whenuapai is likely to be consented very soon. Is the $150 mil of arterial roads that can be deferred until the next decade the same $150 mil of funding for arterial roads that is part of the HIF? I’ll look into this as something is not adding up. Will comment back here next week. The decrease in Northwest figures and increase in southern figures appears to be a case of tinkering with the justification for projects they want or don’t want to do. That’s why they include Sandringham Village as a station for the Dominion Rd light rail line, even though it’s not on the proposed line.